Anniversary CardsThere are 26 products. Have you been invited to a celebration or have you been searching for a special gift for a special person for a birthday, some special anniversary, Abraham, Golden Wedding, or graduation? Are you searching for a unique and beautiful Anniversary Card to write down your most exclusive thoughts? Unique hand-crafted Anniversary Cards from e-shop Unikatnica are made for special events to tell your loved ones how much you love and appreciate them. It is something very special these days to give a unique and personalised Anniversary card, rather that send an e-mail or sms. Unique handmade Anniversary Cards from Unikatnica are made from carefully selected materials and hand designed patterns and motifs. Each card is an aouthor's unique work made only in one piece. You can also personalise them with your own words by letting us know what would you want to write down infront or inside the Anniversary Card. 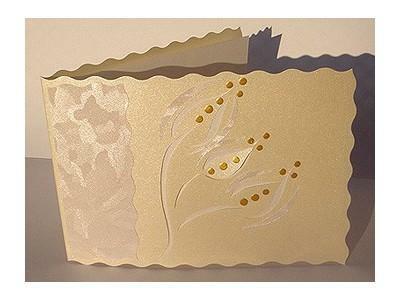 This handmade birthday greeting card represent a lovely, gentle light blue flower with gold contour. Handmade birthday greeting cards from e-store Unikatnica make truly a unique and memorable gift for any special occasion. Important! Before purchasing this handmade birthday greeting card please register/log in to Uniktnica. This beautiful, handmade birthday greeting card represent a lovely, gentle, big light blue flower. Handmade birthday greeting cards from e-store Unikatnica make truly a unique and memorable gift for any special occasion. Important! Before purchasing this handmade birthday greeting card please register/log in to Uniktnica. This beautiful, handmade birthday greeting card represent a lovely, gentle light blue flower. Handmade birthday greeting cards from e-store Unikatnica make truly a unique and memorable gift for any special occasion. Important! Before purchasing this handmade birthday greeting card please register/log in to Uniktnica. This beautiful, handmade birthday greeting card represents a lovely, blue butterfly.. Handmade birthday greeting cards from e-store Unikatnica make truly a unique and memorable gift for any special occasion. Important! Before purchasing this handmade birthday greeting card please register/log in to Uniktnica.